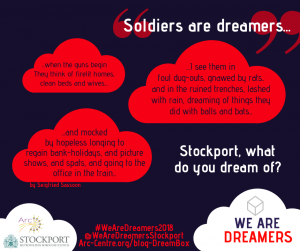 funded arts project called “We Are Dreamers” as part of Stockport Remembers! Would you like to contribute to this large-scale Stockport We Are Dreamers Open Art Installation? 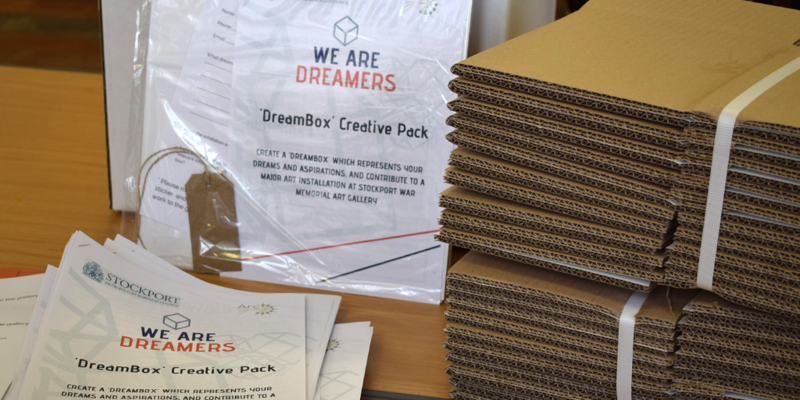 DREAMBOXES ARE NOW AVAILABLE TO COLLECT! 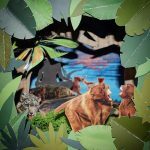 To coincide with the centennial Remembrance Day 2018, this installation curated by acclaimed theatre designer Richard Foxton will be visually striking and inspiring. 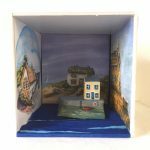 Varying sizes of boxes will create a maze of corridors and gateways allowing visitors to move through and interact with the boxes and give a glimpse into the dreams and hopes of those who have contributed as well as 10 men from Stockport who went to war and din’t return. We can’t wait to see how you’ll fill your box with representations of your hopes and aspirations. 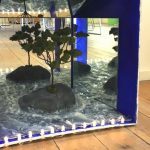 The borough-wide collaborative art installation is part of ‘Stockport Remembers‘, and will open on November 11th at Stockport War Memorial Art Gallery to commemorate 100 years since the end of World War 1. 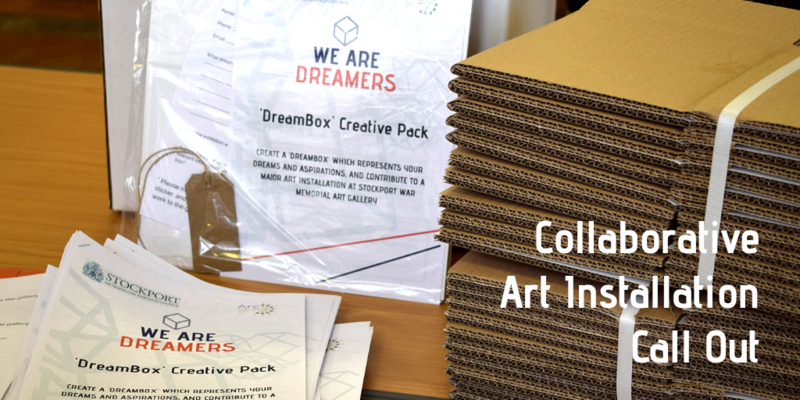 We are looking for artists, individuals and groups to create a DreamBox that represents their dreams and aspirations – a nod to Sasson’s words. 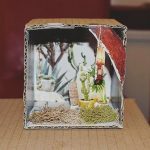 Guided by a brief, participants are welcome to choose any artistic medium to decorate or fill their box. Please find out more in the creative information pack, which you can download here [PDF 228KB] and read the FAQs at the bottom. Individuals and groups who would like to follow We Are Dreamers online and share their progress can Like Arc’s Facebook Page and follow the project on Instagram. 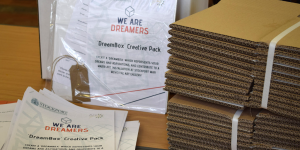 DreamBox inspiration can be found on our Pinterest board and you can also search #WeAreDreamers2018 on Google and Instagram to follow the project. There will be free creative workshops for adults and families and projects running in Stockport. For more details you can visit this post, or see all past blog posts about the project here. Questions can be directed to annette@arc-centre.org, but some FAQs can be found below. How big are the boxes in the pack and what are they made of? Boxes for public collection are 7.5″ wide by 7.5″ tall by 7.5″ deep (19cm) made of corregated cardboard. I don’t live in Stockport, does that matter? Not at all! Does my inspiration or subject have to be about WW1? No. We are looking for representations of the dreams and aspirations for the present and future by contributor in commemoration – a forward-looking project which rather than focusing on the tragedies of the past, commemorates the war through a positive and hope-filled installation. What do you mean by “dreams”? More importantly, what does “dreams” mean to you? You can translate “dreams and aspirations” in whatever way you would like. Some example are: actual dreams; aspirations or hopes or wishes for the future; dreamlike and imagined places; places of hope, positivity and peace; places of excitement; a dream home; something dear to you… however you feel is meaningful to you! What do i write on my hanging label? Whatever you don’t mind being publicly visible. Can I include electronics in the box? Yes, but please make sure that lights are LED only. Unfortunately we can’t provide power for boxes. Battery pack need to be inside the box too. Can you send me a box pack in the post? Unfortunately we cannot post boxes. Can I drop off my finished box to somewhere else, or to Stockport Art Gallery outside of the drop off times? Unfortunately we don’t have the capacity to transport boxes to the gallery, please try to get a friend to deliver your box for you during the allocated times stated in the pack. If you have any further issues please email annette@arc-centre.org. Can I have loose parts in my box? Please ensure all parts are fixed inside the box, and that nothing raised is on the outside of it. 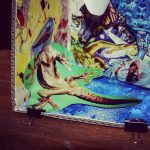 We cannot guarantee that artwork on the outside of the box will be visible. We can’t wait to see your DreamBoxes!